Low nominal interest rates, low inflation, and slow economic growth pose challenges to central bankers. In particular, with estimates of the long-run equilibrium level of the real interest rate quite low, the next recession may occur at a time when the Fed has little room to cut short-term rates. As I have written previously and recent research has explored, problems associated with the zero-lower bound (ZLB) on interest rates could be severe and enduring. While the Fed has other useful policies in its toolkit such as quantitative easing and forward guidance, I am not confident that the current monetary toolbox would prove sufficient to address a sharp downturn. I am therefore sympathetic to the view of San Francisco Fed President John Williams and others that we should be thinking now about adjusting the framework in which monetary policy is conducted, to provide more policy “space” in the future. In a paper presented at the Peterson Institute for International Economics, I propose an option for an alternative monetary framework that I call a temporary price-level target—temporary, because it would apply only at times when short-term interest rates are at or very near zero. One way to increase the scope for monetary policy is to retain the Fed’s current focus on hitting a targeted value of inflation, but to raise the target to, say, 3 or 4 percent. If credible, this change should lead to a corresponding increase in the average level of nominal interest rates, which in turn would give the Fed more space to cut rates in a downturn. This approach has the advantage of being straightforward, relatively easy to communicate and explain; and it would allow the Fed to stay within its established, inflation-targeting framework. However, the approach also has a number of notable shortcomings (as I have discussed here and here). One obvious problem is that a permanent increase in inflation would be highly unpopular with the public. The unpopularity of inflation may be due to reasons that economists find unpersuasive, such as the tendency of people to focus on inflation’s effects on the prices of things they buy but not on the things they sell, including their own labor. But there are also real (if hard to quantify) problems associated with higher inflation, such as the greater difficulty of long-term economic planning or of interpreting price signals in markets. In any case, it’s not a coincidence that the promotion of price stability is a key part of the mandate of the Fed and most other central banks. A higher inflation target would therefore invite a political backlash, perhaps even a legal challenge. More subtle, but equally important, we know from the insightful theoretical work of Paul Krugman, Michael Woodford and Gauti Eggertsson, and others that raising the inflation target is an inefficient approach to dealing with the ZLB. Under the theoretically optimal approach, inflation should rise temporarily following a severe downturn in which monetary policy is constrained by the ZLB. The reason for the temporary increase is that, in the optimal framework, policymakers promise to hold rates “lower for longer” when the ZLB is binding, in order to make up for the fact that the ZLB is preventing current short-term rates from falling as far as would be ideal. The promise of “lower for longer,” if credible, should ease financial conditions before and during the ZLB period, reducing the adverse effects on output and employment but subsequently resulting in a temporary increase in inflation. As Woodford has pointed out (pp. 64-73), raising the inflation target is a suboptimal response to the ZLB problem in that it forces society to bear the costs of higher inflation at all times, instead of only transitorily after periods at the ZLB. Moreover, a once-and-for-all increase in the inflation target does not take into account that, under the theoretically optimal policy, the vigor of the policy response (and thus the magnitude of the temporary increase in inflation) should be calibrated to the duration of the ZLB episode and the severity of the economic downturn. An alternative monetary framework, discussed favorably by President Williams and by a number of others (see here and here) is price-level targeting. A price-level-targeting central bank tries to keep the level of prices on a steady growth path, rising by (say) 2 percent per year; in other words, a price-level-targeter tries to keep the very-long-run average inflation rate at 2 percent. The principal difference between price-level targeting and conventional inflation targeting is the treatment of “bygones.” An inflation-targeter can “look through” a temporary change in the inflation rate so long as inflation returns to target after a time. By ignoring past misses of the target, an inflation targeter lets “bygones be bygones.” A price-level targeter, by contrast, commits to reversing temporary deviations of inflation from target, by following a temporary surge in inflation with a period of inflation below target; and an episode of low inflation with a period of inflation above target. Both inflation targeters and price-level targeters can be “flexible,” in that they can take output and employment considerations into account in determining the speed at which they return to the inflation or price-level target. Throughout this post I am considering only “flexible” variants of policy frameworks. These variants are both closer to the optimal strategies derived in economic models and most consistent with the Fed’s dual mandate, which instructs it to pursue maximum employment as well as price stability. A price-level target has at least two advantages over raising the inflation target. The first is that price-level targeting is consistent with low average inflation (say, 2 percent) over time and thus with the price stability mandate. The second advantage is that price-level targeting has the desirable “lower for longer” or “make-up” feature of the theoretically optimal monetary policy. Under price-level targeting, there is automatic compensation by policymakers for periods in which the ZLB prevents monetary policy from providing adequate stimulus. Specifically, periods in which inflation is below target (as is likely to happen when interest rates are stuck at the ZLB) must be followed by periods in which the central bank shoots for inflation above target, with the overshoot depending (as it optimally should) on the severity of the episode and the cumulative shortfall in monetary easing. If the public understands and expects the central bank to follow the “lower-for-longer” rate-setting strategy, then the expectation of easier policy and more-rapid growth in the future should mitigate declines in output and inflation during the period in which the ZLB is binding, and indeed reduce the frequency with which the ZLB binds at all. For these reasons, adopting a price-level target seems preferable to raising the inflation target. However, this strategy is not without its own drawbacks. For one, it would amount to a significant change in the Fed’s policy framework and reaction function, and it is hard to judge how difficult it would be to get the public and markets to understand the new approach. In particular, switching from the inflation concept to the price-level concept might require considerable education and explanation by policymakers. Another drawback is that the “bygones are not bygones” aspect of this approach is a two-edged sword. Under price-level targeting, the central bank cannot “look through” supply shocks that temporarily drive up inflation, but must commit to tightening to reverse the effects of the shock on the price level. Given that such a process could be painful and have adverse effects on employment and output, the Fed’s commitment to this policy might not be fully credible. Is there a compromise approach? One possibility is to apply a price-level target and the associated “lower-for-longer” principle only to periods around ZLB episodes, retaining the inflation-targeting framework and the current 2 percent target at other times. As with the ordinary price-level target, this approach would implement the lower-for-longer or “make-up” strategy at the ZLB, which—if understood and anticipated by the public—should serve to make encounters with the ZLB shorter, less severe, and less frequent. In this respect, a temporary price-level target would be similar to an ordinary price-level target, which applies at all times. However, a temporary price-level target has two potential advantages. First, a temporary price-level target would not require a major shift away from the existing policy framework: When interest rates are away from the ZLB, the current inflation-targeting framework would remain in place. And at the ZLB, what I am calling here temporary price-level targeting could be explained and communicated as part of an overall inflation-targeting strategy, as it amounts to targeting the average inflation rate over the period in which the ZLB is binding. Thus, communication could remain entirely in terms of inflation goals, a concept with which the public and market participants are already familiar. Second, a temporary price-level target, unlike an ordinary price-level target, would not require the Fed to tighten policy to reverse shocks that temporarily drive up inflation when rates are away from the ZLB. Instead, following the inflation-targeter’s approach, the Fed would simply guide inflation back to target over time. Moreover, because the Fed would be targeting 2 percent inflation in both ZLB and non-ZLB periods, inflation over long periods should average around 2 percent. The Federal Open Market Committee (FOMC) has determined that it will retain its symmetric inflation target of 2 percent. The FOMC will also continue to pursue its balanced approach to price stability and maximum employment. In particular, the speed at which the FOMC aims to return inflation to target will depend on the state of the labor market and the outlook for the economy. However, the FOMC recognizes that, at times, the zero lower bound on the federal funds rate may prevent it from reaching its inflation and employment goals, even with the use of unconventional monetary tools. The Committee therefore agrees that, in future situations in which the funds rate is at or near zero, a necessary condition for raising the funds rate will be that average inflation since the date at which the federal funds rate first hit zero be at least 2 percent. Beyond this necessary condition, in deciding whether to raise the funds rate from zero, the Committee will consider the outlook for the labor market and whether the return of inflation to target appears sustainable. The charts below serve to illustrate this policy as might have been applied to the most recent ZLB episode if, hypothetically, temporary price-level targeting had been in effect. To be clear, nothing in this blog post or my paper should be taken as a commentary on current Fed policy. I am considering instead a counterfactual world in which the announcement above had been made, and internalized by markets, prior to when the short-term rate hit zero in 2008. 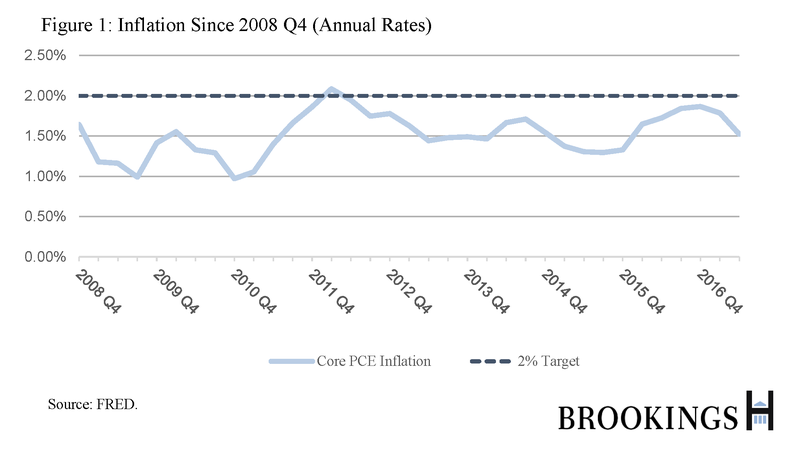 Figure 1 shows the behavior of (core PCE) inflation since 2008 Q4, the quarter in which the federal funds rate effectively reached zero and thus marked the beginning of the ZLB episode. Since 2008, inflation has been below the 2 percent inflation target most of the time. The effect of this persistent undershoot of inflation relative to the 2 percent target has been a persistent undershoot of the overall level of prices, relative to trend. 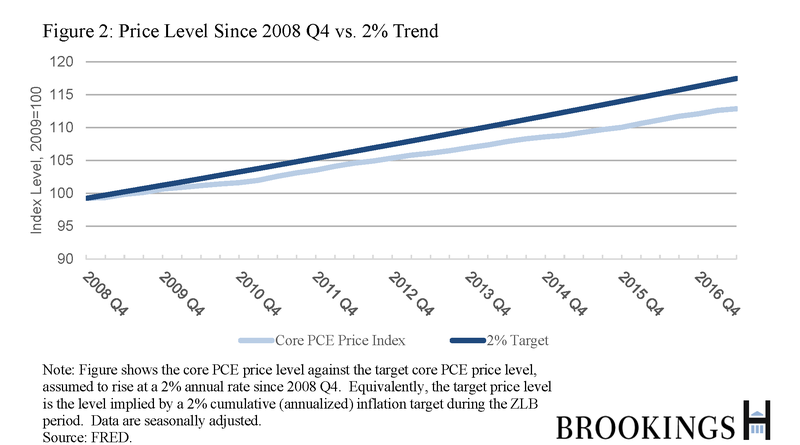 Figure 2 shows recent values of the (core PCE) price level relative to a 2 percent trend starting in 2008 Q4. As the figure shows, the price level is lower than it would have been had inflation been at the Fed’s 2% inflation target over the entire period. If a temporary price-level target had been in place, the Fed would have sought to “make up” for this cumulative shortfall in inflation. The necessary condition outlined in paragraph (2) of the framework, that average inflation over the ZLB period be at least 2 percent, is equivalent to the price level (light blue line) returning to its trend (dark blue line). A period of inflation exceeding 2 percent would be necessary to satisfy that criterion, thereby compensating for the previous shortfall in inflation during the ZLB period (i.e. the slope of the light blue line would need to increase in order to converge with the dark blue line). The result would be a lower-for-longer rates policy, which would be communicated and internalized by markets in advance. The easier financial conditions that would have resulted could have hastened the desired outcomes of economic recovery and the return of inflation to target. Notably, this framework would obviate the need for (and be superior to) the use of ad hoc forward guidance about rate policy. Importantly, under my proposal and as suggested by the mock FOMC statement above, meeting the average-inflation criterion is a necessary but not sufficient condition to raise rates from the ZLB. First, monetary policymakers would want to be sure that the average inflation condition is being met on a sustainable basis and not as the result of a transitory shock or measurement error. Expressing the condition in terms of core rather than headline inflation, as in the figures above, would help on that score. Second, consistent with the concept of “flexible” targeting, policymakers would also want to factor in real economic conditions such as employment and output in deciding whether it was time to raise rates. In sum, a temporary price-level target, invoked only during ZLB episodes, appears to have many of the benefits of ordinary price-level targeting. It would preserve the commitment to price stability. Importantly, it would create the expectation among market participants that ZLB episodes will lead to “lower-for-longer” or “make-up” rate policies, which would ease financial conditions and help mitigate the frequency and severity of such episodes. Unlike an ordinary price-level target, however, the temporary variant could be folded into existing inflation-targeting regimes in a straightforward way, minimizing the need to change longstanding policy frameworks and communications practices. In particular, central bank communication could remain focused on inflation goals. Finally, in contrast to an ordinary price-level target, the proposed approach would allow policymakers to continue to “look through” temporary inflation shocks that occur when rates are away from the ZLB. This problem would be mitigated but not eliminated if the price-level target were defined in terms of core inflation, excluding volatile food and energy prices.